One of the most frustrating things about mentoring is FINDING a mentor. I wasn’t even aware I needed a mentor until about 10 years into my career. Had I known mentors? Yes, but I wasn’t aware they were mentors. Once I began speaking and coaching, I found that mentoring kept bubbling to the top as a topic which created confusion, frustration, complacency and hesitation. Generally speaking, we don’t do a great job at finding mentors or keeping them. There are a lucky few of us who join companies with formal mentoring programs, but even then the relationships can fall flat. Many mentor relationships are informal. We don’t have to wait on a formal program. We can have more than one at a time, and we should. We need to be as clear about why we need a mentor as we are about needing one in the first place. Ah yes. That IS the key. 1. Start with a little networking. Find a professional association (like Society for Human Resource Managers, the American Marketing Association or National Association of Women Lawyers) or a networking organization (e.g. Any city chamber, Ellevate Network, National Association of Women Business Owners) and start going to the events. Join if you’re feeling adventurous. This is where you are going to meet your mentor candidates. 2. Go on a first date. Don’t kid yourself. A mentoring relationship is actually a relationship. Just like you don’t marry a stranger, you also wouldn’t expect to magically match up with the perfect mentor. Finding a mentor on your own is a bit like dating. Sometimes it’s a love connection and sometimes you take your parting gift and go home. When you meet someone who seems interesting, and they demonstrate a behavior or skill you’d like to have, ask that person to join you for coffee before work one morning. Don’t take up too much time and make it really convenient for them (location and time). Don’t forget to pay – remember you asked them. Did the first one go well? Put yourself out there and ask if your coffee partner would be interested in meeting up again in a few weeks or months. Tell the other person what you really enjoyed about your first conversation and what you want to know more about during the second conversation. Maybe it’s coffee, or lunch, or cocktails. Ask the other person what they prefer. Be prepared to pay and at least offer but it may be less expected the more often you meet. I wouldn’t start a conversation with “Would you be my mentor?” That might be weird and uncomfortable. A mentoring relationship doesn’t have to be formal. 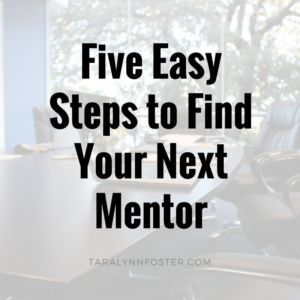 In fact, you probably have many mentors right now or have had them in the past without calling them “mentors.” Why not just ask the mentor candidate if they would be willing to meet with you periodically? Be prepared to tell them why. What is it that you admire about them? What do you hope to learn from them? How can they help you and how can YOU help them? 5. Know when to hold ‘em, know when to fold ‘em. I was once in a situation where I was meeting with someone once a month at my request. Initially, the connection was helpful. I was looking for insight on how to keep climbing while being a kicka** mom. At a certain point, I wasn’t interested in pursuing the same functional business area and our conversations flatlined. After the last meeting that felt more difficult than the one before, I decided it was time to call it quits. With all kinds of gratitude and diplomacy, I thanked my mentor for her time and offered to give her that hour back. When she graciously accepted, I knew I had done the right thing. Keep your emotional intelligence antennae up and know when to call it. So there you have it: that’s how you find a mentor. Are you in a professional association or networking group? Maybe you are meeting with someone on a regular basis but hadn’t consider them a mentor – BONUS! What other questions do you have about finding a mentor? What’s worked well for you in the past? What would you prefer to hear or have happen as a mentor-candidate. People want your expertise. How would you like to be asked to be a mentor? Share your ideas in the comments – your experience could help someone else!